Moscow and Beijing have kicked off the first joint military drills scheduled for this summer. The “Joint Sea – 2013″ drills are being held under the aegis of the Shanghai Cooperation organisation in the Peter the Great Gulf in the Sea of Japan until July 12. The drills will involve 18 warships, a submarine, three planes, five helicopters and two diversion groups. “Joint Sea – 2013” is China’s largest military drills with a foreign partner. The Chinese fleet is represented by seven warships including four guided-missile destroyers, two guided-missile frigates, a supply ship, and three shipborne helicopters and a special operations detachment. The aim of the drills is “to deepen military cooperation and to ensure prompt response to common threats”. Andrey Devyatov, a former colonel in Soviet military intelligence, expert on China’s military and author of the book The Specific Chinese Character, says this year’s drills are the second phase of the 2012 drills in the Yellow Sea. “Joint naval drills in the Sea of Japan between the Russian Navy and the Chinese Navy are the second phase of naval military cooperation, following the Sino-Russian drills in the Sea of Japan. It is a continuation of what was started last year. The goal is to train teamwork while solving the issues of naval security of trade communication, crucial for raw materials’ supply to Chinese factories of the 21st century since all of those naval routes are currently controlled by the US Navy,” Devyatov told The BRICS Post. China has asserted that the drills are not targeted towards any nation, and has criticised media reports that the drills being a counter to US-Japan joint exercises that were conducted earlier this year. “It is hard to ignore the fact that the countries which are doing most to hype up the China-Russia threat are those which make little effort to conceal their own determination to expand their military presence in the area in order to “contain” China,” says an editorial in the state run People’s Daily in a reference to the Washington’s Asia pivot. Alexander Khramchikhin, a Deputy Director of the Moscow-based Institute for Political and Military Analysis, says the drills also show the potential for a military union of immense strength. “The drills are a pure demonstration of combined strength. Although, these are routine drills and are not being held for the first time, they do show a potential alliance between Russia and China in the military sphere, though not a formal alliance,” Khramchikhin told The BRICS Post. 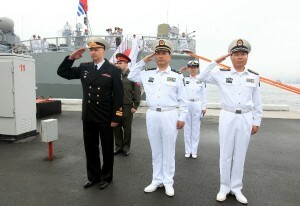 Sino-Russian joint military drills have been held on a regular basis since 2005. The second Sino-Russian joint military drills “Peaceful Mission 2013” will be held from July 27 till August 15 at the Chebarkul military training ground in Russia’s Chelyabinsk region.